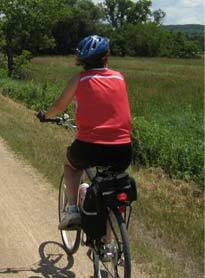 I hope some of you can join me to ride 2 loops of the Poplar Creek trail on Thursday, July 26th. We'll begin riding at 9:15, so plan to arrive about 9:00 to get your bike ready, etc. The distance will be approx. 18 miles. Faster riders can go ahead. No one left behind. Meet at the first entrance to PoplarCreek from Bode Road, just west of Barrington Road. It's called the Bode East entrance. It's helpful to know if you plan to ride, so I can be on the lookout for you. If there is any reason to cancel, I will email you by 7:00 am Thursday.